There’s a certain company — don’t want to name names, but it makes very popular products and rhymes with “Migidesign” — that sells decent audio converters and DSP systems at very expensive prices. They lock you into a single software solution, and when you want to go mobile, you have to give up all the pro-level audio equipment or lug studio-size gear with you. Native alternatives have always let you choose your audio system, and that’s a good thing. This year, Apple worked with Apogee to allow users of Logic and other native platforms to use what most people feel are superior converters. And whereas running native on the CPU used to cause some serious problems compared to dedicated DSP hardware, modern Intel chips give you more capabilities than you could ever use. So far, so good. But the problem of mobility remained: the need for PCI Express slots means you have to lug around a tower. One cable to rule them all: You have to buy all new audio hardware to go mobile, right? Wrong. 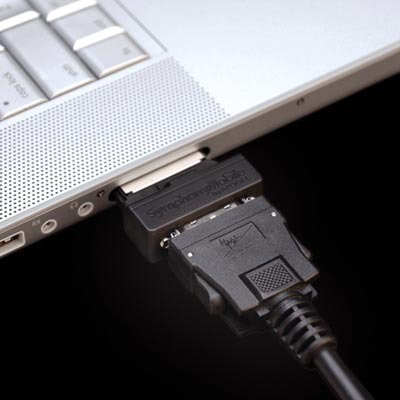 Unplug your audio I/O hardware, then plug the same cable into an ExpressCard interface for a MacBook Pro. That’s all it takes. 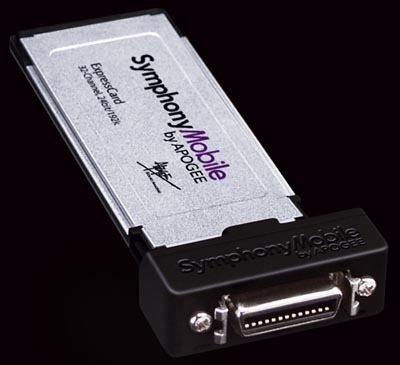 You still have to buy the ExpressCard adapter, but you don’t have to buy two sets of converters. Total software flexibility: Apple of course wanted to talk about their integration with Logic Pro, which is very nice and adds some great mixing functionality. But it’s important to note that, not only do you have the flexibility of AU plug-ins in Logic instead of a proprietary DSP system, the Apogee hardware is Core Audio-compatible and works with any app on the Mac. DP, Cubase, even Ableton Live? Use whatever you like, and switch if you like. There’s nothing inherently wrong with going all Pro Tools, all the time, but I have to observe that the alternative actually lets you choose instead of your hardware choosing for you. High-end I/O on the road: The solution scales from simple 2 in / 2 out all the way to 32 channels of 192kHz, 24-bit sound, and the MacBook Pro and Core Duo will scale with it (thanks, Intel), all with 1.6 ms of latency — well below the threshold of what almost anyone can hear. Apple also had some interesting benchmarks to talk about. They’ve got their quad Mac Pro running 30 Sculpture instrument instances as opposed to the quad G5’s 17, ran 1.8X the number of Platinum Reverb effects, and 174 MBit/s data throughput from the Mac Pro’s new four drive bays, compared to 61 MBit/s on the G5. Track count: 256 at 192k. As I found last year in Core Duo (not even Core 2 Duo) MacBook Pro tests, the new Intel laptop does decently on its own, with some 240 Platinum Reverb instances compared to 30 on a PowerBook G4, so production on the road is a reality. Apple’s tests aren’t real world, but they do indicate that processing headroom is not going to be a major problem. So, everyone’s dumping Pro Tools, then? Don’t bet on it: I think studios will remain stubbornly loyal to the system they’ve already invested in, and Apple hasn’t answered questions (yet) about how they can compete with Pro Tools’ saturation in fields like post production. That said, this does demonstrate the flexibility native systems offer, and someone is going to take advantage of it. By the way, one thing Apple is not doing at NAMM is announcing any new software. I’ll admit; I’m disappointed, and I think the Apogee announcement will have an even greater impact once Apple has some newer software to show with it. But I’m guessing that the absence of any pro apps at NAMM and any consumer apps at Macworld means Apple’s software pipeline is waiting on the release of Leopard. Granted, we’re spoiled as it is with how quickly software in general is updated, but given the timing in the past, it seems at least possible that these will coincide with the new OS. Whatever the reason (and maybe it is just the existing development cycle), I know there are (of course) new versions of GarageBand, Logic Pro, and Apple’s other software in the works, and you’ll hear about them here when they’re official.